Saute the sausage in a medium skillet over medium-high heat until browned (about 5 minutes). Add the butter and potatoes to the sausage and stir to combine. Continue to cook until potatoes are slightly browned (about 3-5 minutes), then remove from heat and let cool (about 10 minutes). In a medium bowl, combine the flour, baking powder, cheese, chives, salt and pepper. Next, whisk the eggs and milk into the flour mixture until smooth. Add the potatoes and sausage to the mixture and stir until they are evenly distributed throughout. Pour 3/4 cup batter onto a heated waffle griddle, close the lid, and wait until the waffle is cooked through (about 3 minutes- most waffle makers will have a light indicating when to take out the waffle). Butter each waffle and serve with salsa, guacamole and cheese, or other condiments desired. That looks amazing. What a great idea! This is great. I always look forward to the day when we are having cheesy hash-browns. To combine that with sausage and then put in a waffle is amazing. Love it. Wow these waffles look delicious! Looks delicious! 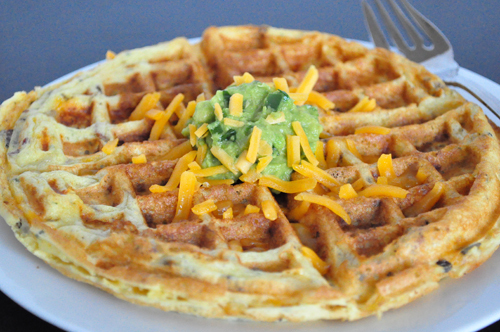 I’d love a savory waffle like this! I have an old, really thin heart waffle maker, I hope it will work with it. And I just found out that waffles freeze pretty well after you make them, this would be amazing as I’m rushing out for class! 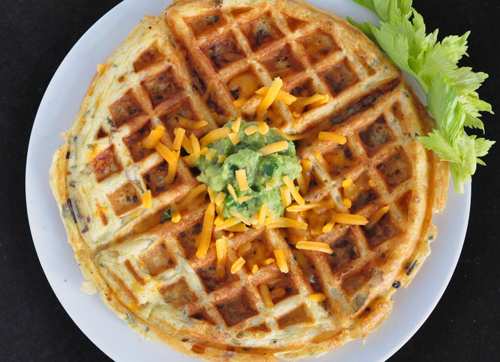 A savory waffle?! Yes please! This sounds great! haha Good to hear. sounds delicious!